As a business owner, you want your customers to be satisfied. Not just with your products or services, but also with your flexibility in payment options. What is it about credit cards that makes them such a hot business commodity? According to the American Bankers Association, there were 364 million open credit card accounts in the U.S. at the end of 2017, a 4.1% increase from 2016. Credit card companies reimburse fraud losses, offer rewards, protect purchases through the chargeback system, and essentially loan money to people—what’s not to love?! They’ve become a staple in our wallets, both physical and mobile. Credit cards don’t just promote customer satisfaction; they help your business meet customer expectation in this day and age. Offering customers convenience and flexibility in payment options enhances their entire shopping experience at your store. After one overall positive experience, customers are more likely to come back. Cash and check only businesses miss out on a lot of revenue by turning away cardholders without cash on hand. The impulse buying associated with credit cards also makes it likely that customers will spend more at your store than they would with cash, checks or debit cards. Undoubtedly, other businesses in your industry are accepting credit cards. 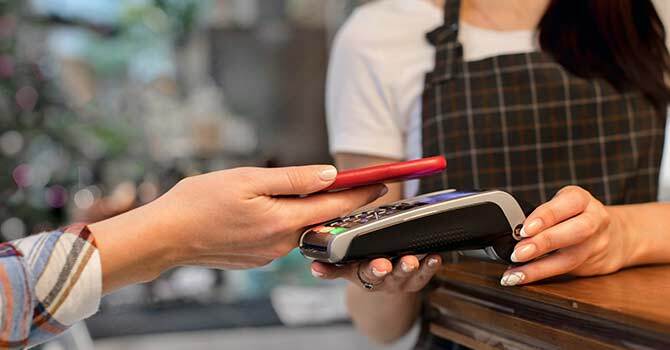 In the increasingly crowded marketplace, a customer’s choice between your business and your competitor’s could boil down to the methods of payments you accept. The ability to pay in store, online or over the phone with a credit card wins out. Accepting credit cards levels the playing field and helps future-proof your business. Have you ever let a customer finance a product or service with monthly payments? If they’re restricted by cash and checks, you might worry that they’ll stop paying, or that their checks will bounce. But chances are, they’ll make the payments with a credit card even if the money isn’t readily available in their bank accounts. Those chances are higher if you’re providing a quality product or service they really value. Whether or not they pay their credit card bill at the end of the month doesn’t affect your income from the sale, so you’re essentially shifting the risk of nonpayment to the customer’s credit card company. In turn, credit cards reduce late payments. When you allow customers to use their preferred method of payment, they are more likely to pay you by your preferred due date. When more payments are on time, your cash flow is more consistent and you have fewer accounts receivable stacking up. Outstanding payments cost your business extra resources to collect on top of the owed amounts. It’s possible for a business to employ a cash-only model if they have an extremely devoted pool of customers and a unique product customers can’t find somewhere else. However, that’s not a common scenario in the 21stcentury. Many businesses are selling similar, if not the same, products and services. When a new customer walks through the door, they might be surprised if a business doesn’t accept credit cards and choose to shop elsewhere. And even when people do carry cash, it’s usually in small amounts, limiting their purchasing power. Customers trust major credit card brands like Visa, MasterCard, Discover and American Express. When you accept those card brands, that sense of trust tends to extend to your products, services and business as a whole. They help your establishment exude professionalism and legitimacy. They give your customers clear-cut transaction records for budgeting purposes, can help boost their credit scores and more. Point of sale equipment and payment gateways are designed to do a lot more than simply process credit card transactions. They can track your inventory, manage employee timesheets, produce insightful sales reports and integrate with thousands of industry-specific applications. Transaction records and accounting become a lot easier to manage than with cash. You can also accept electronic checks, or echecks, and gift cards with a credit card processing solution. Once you have a merchant account to accept credit cards, opportunities to expand your business increase exponentially. Launching an online store, accepting payments over the phone, or opening a pop-up shop that you can set up at events, trade shows or wherever your customers are going are just a few examples. There are also perks some merchant account providers bundle with your credit card processing services, such as merchant lending options if you need fast access to capital for expansion, replacing equipment, starting a new marketing campaign—you name it. You might be thinking, “Well, what about the transaction rates? Don’t they cut into profits? And aren’t the startup costs pretty expensive?” Setting up a merchant account is affordable and quickly pays for itself, and then some. The key to finding the most cost-effective yet powerful payment solution is to sift through the thousands of merchant service providers who want your business. While the bulk of transaction rates is charged by the card brands, non-negotiable, and simply passed through to you by the merchant account provider, the markup account providers charge for their middleman services is negotiable. You’ll want to exercise your negotiating power and also consult resources like the Visa Registry of Global Service Providers and the Better Business Bureau to find the merchant service provider that’s best for your business. Interested in learning more? Visit our resources page.